I love making my own bath and beauty products, not only for my own benefit, but to give as gifts to friends and family. 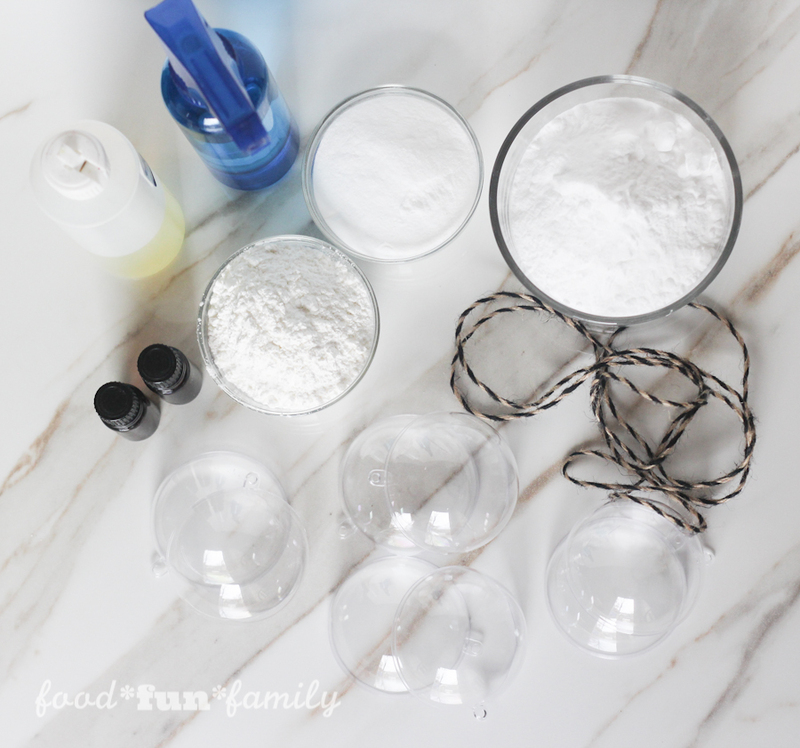 I use my DIY sugar scrubs every single day in the shower (they are amazing for cleaning and moisturizing my face, and my homemade sugar scrub makes the best shaving “cream” ever!). My youngest son, even though he’s 11 now, still prefers taking baths, and I admit that I do love a nice relaxing bath (especially when I’ve got the house to myself and I can relax and soak for as long as I’d like!). There’s nothing more soothing that a hot bath and a fizzing bath bomb. 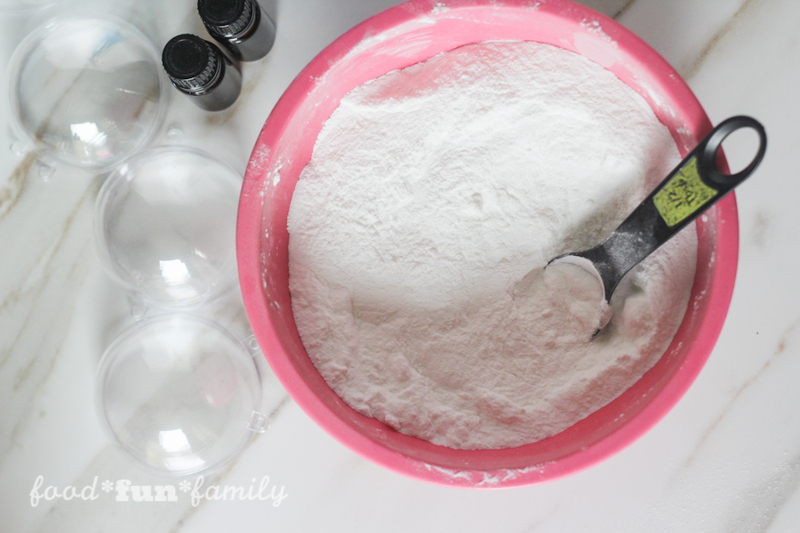 If you’ve never made fizzy bath bombs before, here’s what you need to know: when baking soda and citric acid are mixed together and then added to water, a chemical reaction occurs. As the bath bomb dissolves, the reaction between the baking soda, citric acid, and water creates carbon dioxide, which results in lots of bubbles. Those bubbles not only make the water feel fizzy, but they release the soothing scent of the peppermint essential oils into the air, too. Peppermint is not only one of my favorite scents of the holidays, but it is one of my favorite scents year-round. I especially love peppermint essential oils for soothing a headache or helping clear or calm my sinuses, which is a constant problem for me during the winter months. If peppermint is not your thing, or you’d just like to shake things up a bit and make a different scent, you can use any essential oils or leave them out altogether. Recommended: for an even more festive scent, try Candy Cane essential oil blend, which combines peppermint, lavender, orange, and vanilla. It’s heavenly! 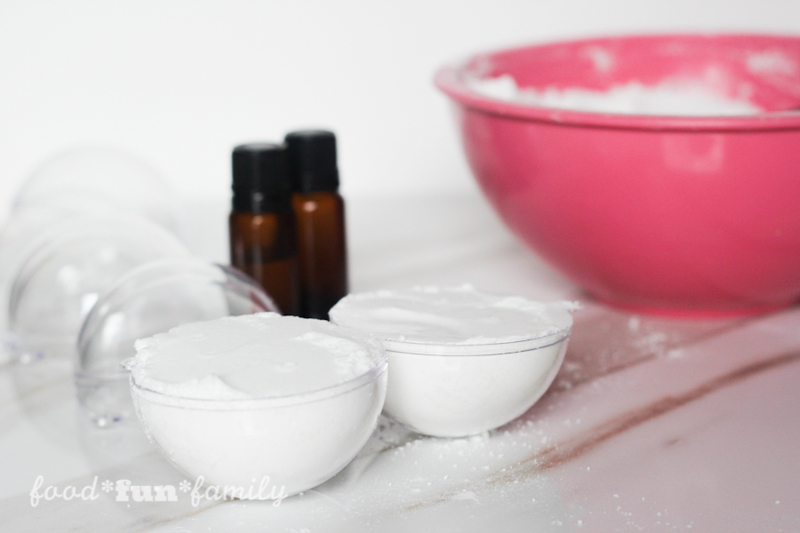 Ready to see how to make your own bath bombs? Combine dry ingredients in a small mixing bowl; mix well. Add almond oil and essential and stir. Spray a small amount of water (4-5 squirts) on the surface of the dry mixture. Stir. Keep adding a few quirts and mixing until you have a consistency that sticks together (kind of like moon sand) when you pinch the powder together. You only need to use a small amount of water total (about a half teaspoon or less). Scoop mixed bath bomb ingredients into both sides of the plastic ornament and pack down. Leave a little extra scooped on top so that when you carefully fit both sides of the ball together, the bath bomb is packed in tightly. The more tightly packed your ingredients are, the better your ornament balls will stay together once you open you bath bomb. Let bath bombs dry for several hours or overnight before opening. 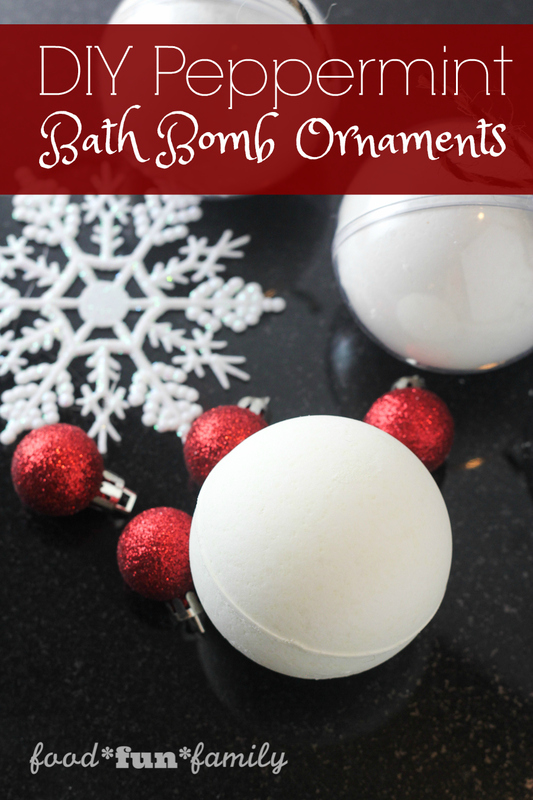 Store bath bombs inside ornaments in a cool, dry place until ready to use. To use: drop a bath bomb into your hot bath water and enjoy the fizz and the scent! Bath bombs will stick together when they’re packed tightly enough together, but be warned: they are VERY delicate! It’s best to store them inside the plastic ornaments until ready to use. You can use half of a bath bomb by carefully sliding the two halves apart and setting one aside to use later. Again, bath bombs tend to be delicate so it’s fairly easy to break them apart at the half mark. Half a bath bomb was plenty for my youngest son. Peppermint essential oil is a “hot” oil, and I would highly recommend avoiding getting any of the oils in your eyes (and that includes rubbing your eyes with your hand safter soaking them in the bath). Citric acid can be found in the canning section at many grocery stores and Walmart. However, it’s hard to find in stores in the winter. I highly recommend ordering some on Amazon and save yourself a trip around town. 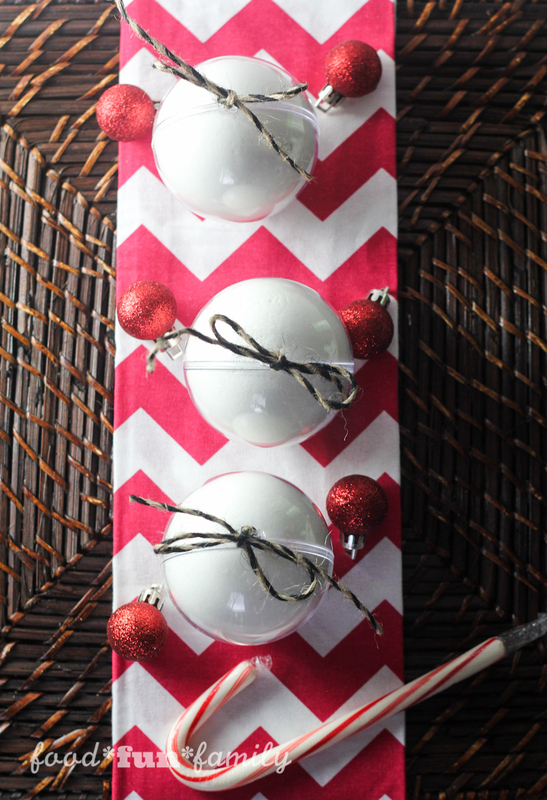 Be sure to check out these other great Christmas themed DIY projects, too! Be sure to search the #DIYDivas hashtag to see past projects. These bath bombs look really pretty. Thanks for sharing such a nice and easy recipe. Wow! This is such a lovely gift idea. Though I love to make my own bath bombs and recently made Himalayan salt bath bombs. They turned out great. But I never thought bath bombs could be a gift as well. I will definitely make these peppermint bath bombs and gift them to my friends. I think this such a great idea to put the bath bomb into an ornament! Love it! 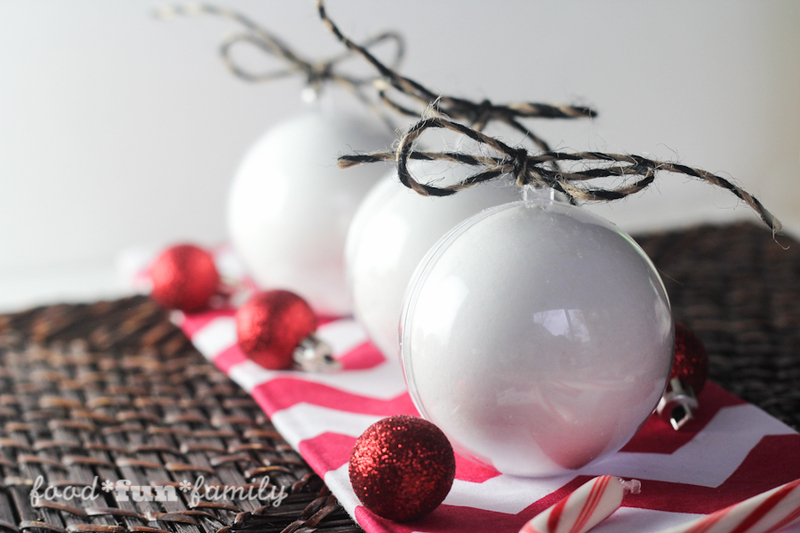 I love the smell of peppermint and these peppermint bath bombs would be a hit for the Holidays. I want to get these and hand out to my family! This would make a great gift! I love how festive it looks! How many bath bombs will this recipe make? Making some for gifts and want to have enough ingredients.